Walt Frazier is scheduled to meet and greet fans and sign autographs and memorabilia at 1:00 p.m. Thursday, August 4, 2016. An autograph ticket must be purchased for every signature you want. (Except free autograph guests.) Autograph tickets may be purchased in advance, or on-site at the TRISTAR Autograph Ticket Booth. Fees vary for each guest. 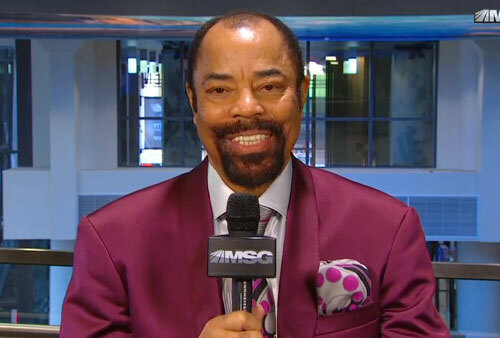 Walt Frazier is a former NBA guard who played for the New York Knicks and Cleveland Cavaliers. He is now a broadcaster for Knicks games on the MSG Network. Walt Frazier was selected by the New York Knicks with the 5th pick in the 1967 NBA Draft and played for them during which time he picked up the nickname “Clyde” because he wore a similar hat to Warren Beatty who played Clyde Barrow in the 1967 movie Bonnie and Clyde. Frazier was an NBA All-Star seven times and was named MVP of the 1975 NBA All-Star Game. He was also named to the All-NBA First Team four times, the All-NBA Second Team twice, and the All-Defensive First Team seven times. Sports Speakers 360 is a booking agent for pro athletes. If you would like to book Walt Frazier for a speaking engagement, appearance or endorsement, contact a Walt Frazier booking agent for fees at 1.855.303.5450.